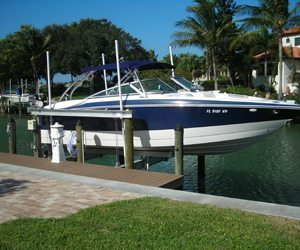 BOAT LIFTS | Atkin Marine Services Inc.
To house your boat safely and securely we recommend Neptune Boat Lifts. 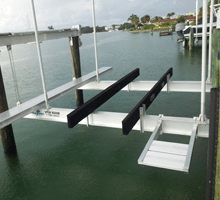 Our lifts are built in Florida with the highest quality materials and assembled with expert design, providing secure lift operation for any size boat.Neptune Aluminum Lifts are available with stainless steel motors, quick adjust stainless steel cables, heavy duty guide poles, aluminum pulleys with grease fittings and come with a 10 year limited warranty. Expert craftsmanship at competitive prices – call us for all your docking needs, and set yourself up for smooth sailing! Our lift capacities range from 4,500 lbs to 180,000 lbs and Personal Watercraft Lifts range from 1,500 lbs to 17,000 lbs. Aluminum Pulleys with Greasable Bearings (1” Thick verses “others” ¾” Thick) Neptune’s Proprietary 1” extra wide Sheaves (Pulleys) include an internal machined grease groove. This feature allows for significantly lower maintenance, quieter operation and extended longevity of the Pulleys and Axles. Standard Fully Carpeted #1 Pressure Treated Wooden Bunks with Custom Angle. Our optional Aluminum Bunks are the perfect fit for a Standard V-Hull Boat, but with so many variations of boats out there Neptune is able to provide the proper bunking system to lift your boat perfectly each time. 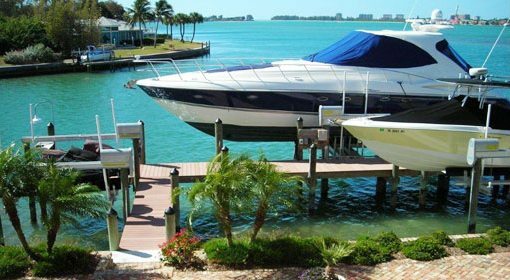 From Step Hulled Boats, Catamaran Boats, Pontoon Boats, Keeled Boats to Sailboats – by providing us with the make and model of your boat we will assure you have the proper system needed. We have a “quick adjustment” cable feature which simplifies cable/cradle adjustments. With this feature the cable has bare ends so that no “custom” cables are required. Save a lot time and money on cable replacement. Our replacement wireless remote control, hand-held transmitters are substantially less expensive.